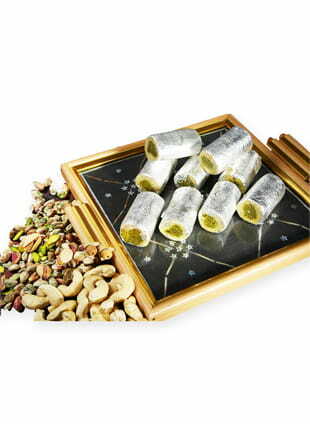 The beautiful sweet which you see here is called KajuPista Roll and as it is named, it contains Kaju (cashew nut) and Pista (pistachio), both of which are famous and very popular dry fruits. So in short you get to taste two delicious dry fruits in a single sweet! As attractive as it looks, this particular sweet has been especially prepared to combine the nutritious qualities of the two dry fruits in a form which can be fed to fussy children and esteemed guests alike! You can also gift it to a loved one on special occasions to make it extra special! All you need to do is buy it online from FoodFeasta.com!